ATLANTA…As part of a partnership with the Al Jalila Foundation, The Carter Center announced today two new recipients of the Rosalynn Carter Fellowships for Mental Health Journalism Program in the United Arab Emirates (UAE). The program is the first mental health fellowship program for journalists in the Middle East, launched in the UAE in 2016 with two journalism fellows. See below for journalist names and project topics. Over nearly two decades, the Center has awarded one-year fellowships to nearly 200 journalists to connect them with resources and experts to increase the quality and accuracy of mental health reporting around the world. The program is currently in the United States, Qatar, the United Arab Emirates, and Colombia and was previously in New Zealand, South Africa, and Romania. “These fellows can reshape how media in the Middle East covers one of the most significant, misunderstood public health problems. 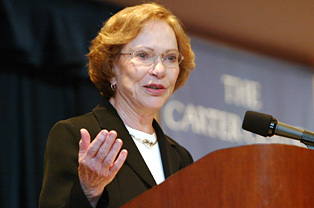 Like the fellows before them, they will likely impact their colleagues and newsrooms, and become the point person in their field on mental health issues,” said former U.S. First Lady Rosalynn Carter. The Carter Center provides training, educational materials, mentorship, evaluation tools, and technical assistance to Al Jalila Foundation to develop a sustainable and tailored program in the UAE. The Al Jalila Foundation manages the program in the UAE and is responsible for the selection of journalists and adapting the program to meet the needs of the Emirates. Since the Rosalynn Carter Fellowships for Mental Health Journalism were established in 1996, fellows have produced more than 1500 stories, documentaries, books, and other works during and after their fellowship year. Their projects have garnered Emmy Awards, nominations for the Pulitzer Prize, and other awards. Project: A study on mental health issues among UAE youth and to disseminate information on why and how to support people who suffer from mental illnesses. Project: Explore why the treatment of mental illnesses remains shrouded in fear and misconceptions in the UAE and how to reduce mental health stigma.